Elsewhere in the Philippines, May 1 will always be known as Labor Day. 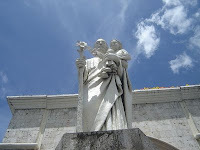 But in Tagbilaran and in the rest of Bohol, we know it as the feast of St. Joseph, patron saint of the city. But in the church's calendar, March 19 is really the original feast of St. Joseph. They say that the reason why we celebrate it on May 1 is that the people want to celebrate it after Lent. I guess no one wants to hold a feast during that period. Jes Tirol, our dear Boholano historian, tells us there is a deeper story behind it. According to him, the May 1 feast was designed to lessen the rivalry between Poblacion 1 and 2 who before were celebrarting different fiestas. There is hardly no hint of such rivalry in the May 1 fiesta of Tagbilaran these days. The residents of the city, at least those living in the poblacion and in the adjacent barangays, celebrate it with as much pomp as everybody else. It is really our way of thanking the Lord and our patron saint, St. Joseph, for all blessing received during the year. Advance happy fiesta everyone.